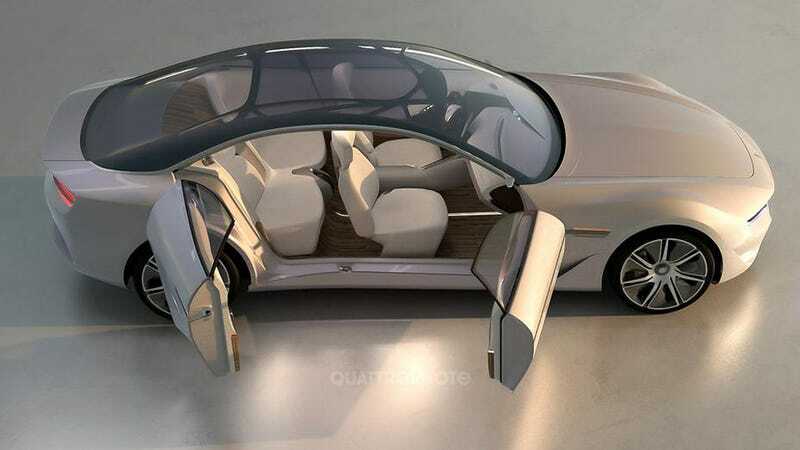 Quattroruote, the same Italian magazine that leaked shots of Lamborghini's SUV, has now dropped the official photos of Pininfarina's three-door diesel-turbine-hybrid concept car, the Cambiano, that we were supposed to see at the Geneva Motor Show next week. The last time we saw the Cambiano, named after the Italian styling house's home town, it was hanging out in the desert with some ribbons, but now we can not only get a full view of the body, the interior and the styling sketches. Pininfarina claims that the Cambiano is inspired by the carrozzeria's landmark 1957 Lancia Florida, but all we can see that it shares is some semblance of its inset rear window and swooping rear pillars. It's nowhere near as groundbreaking as the Florida, but at the Camiano is at least one of the more attractive high-tech hybrid cars we've seen. It might look like a cross between a Fisker Karma and Chevy's Chevelle concept car from a few years back, but that's not a bad thing. We had trouble gleaning more information from the google translated page, but Pininfarina claims that the Cambiano will hit 0-62 in 4.2 seconds, that it has four 80 horsepower (60kW) electric motors at the wheels, and that it has a front-mounted diesel turbine to act as a generator when the batteries run down. Weight is pegged at about 3,700 pounds and it's over sixteen feet long. We're looking forward to seeing this thing at the Geneva Motor Show, if only to beg Pininfarina to make it into the next Lancia flagship.